An attribute describes metadata that should be associated with a particular type member. 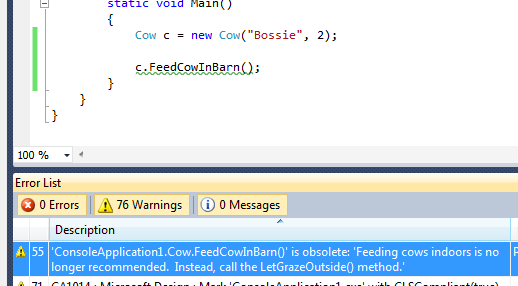 Below is an example of attaching the Obsolete attribute to the Cow.FeedCowInBarn method. A developer can use this attribute to mark a method as being obsolete or deprecated, indicating that it should no longer be called. You attach an attribute to a type member by using a square bracket followed by the name of the attribute and then any arguments that the attribute takes. The Obsolete attribute takes a single argument that will be displayed at compile time when code tries to call the associated method. 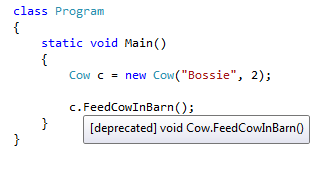 Intellisense now tells us that the method is deprecated. We also see the specified message at compile-time.